Thanks to this working woman, my feet are clad in crocs. Unfortunately, the only ones the store had in my size were not in my color. So my baby blue feet may look weird, but they feel great. They should be nice on the river boat and in the garden. I'm already in the habit of slipping them on when I need to run outside. As I continued to run errands, I saw two other women wearing crocs, although both were in a sedate beige. My feet just scream, "Look at me!" 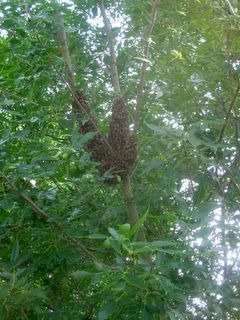 A book club friend called me this morning for my advice on this swarm of honey bees her son just found in their front yard. 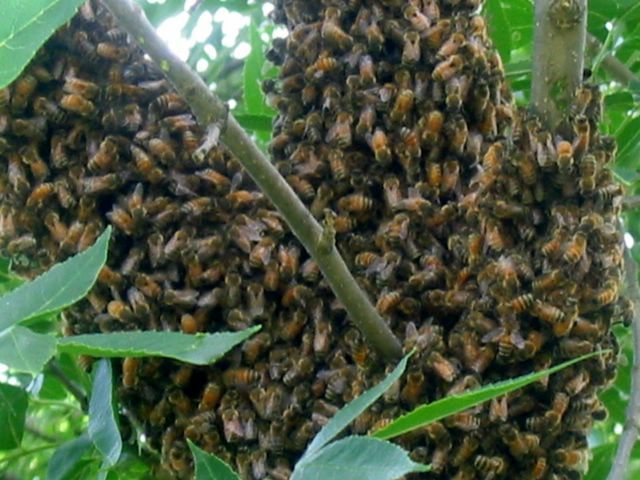 Since I read "The Secret Lives of Bees" and "A Country Year," I became interested in having a few hives of these interesting, beneficial and productive insects. I got a few more books from the library and talked to several beekeepers, but did not have time this spring to start the hives and was not prepared to help her. She called a beekeeper who tried coaxing them into a box. Because wild or feral honeybees were almost wiped out due to varroa mites, this was a very unusual and interesting event. "Good memories are like charms, Nicky. Each is special. You collect them, one by one, until one day you look back and discover they make a long, colorful bracelet." 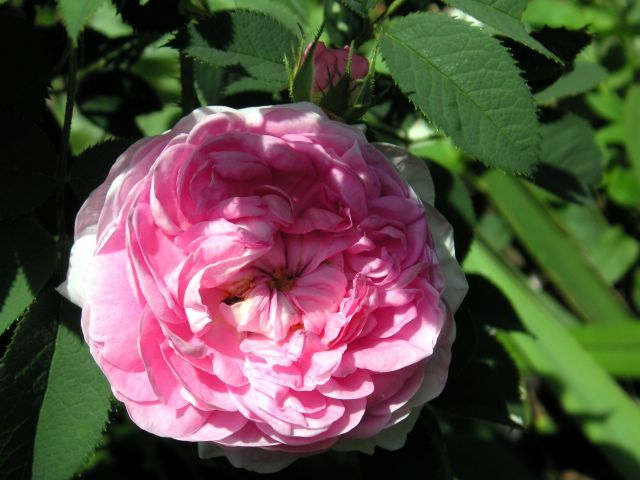 And an old rose - Empress Josephine - created by Napoleon for his true love. 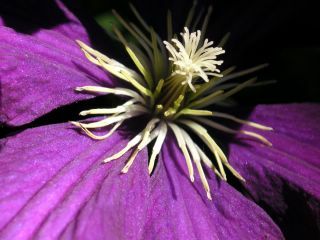 Here are a few pictures from my cultivated garden - the clematis has gone crazy this year. 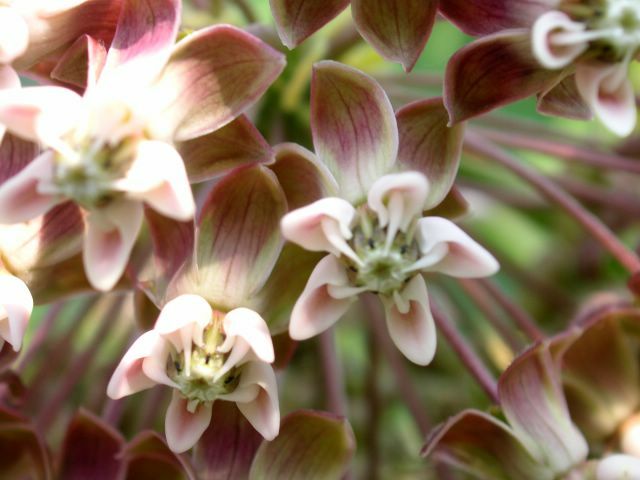 Here's a (much) closer shot of the milkweeds. What an intricate flower and so fragrant. 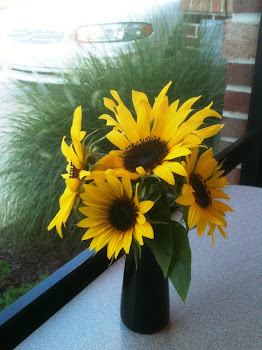 I saw a monarch flitting around but it didn't want to stay around to get its picture taken. 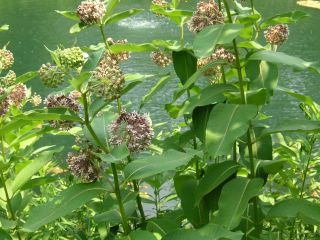 And then we looked down from the tree and saw the milkweeds in bloom next to the pond. 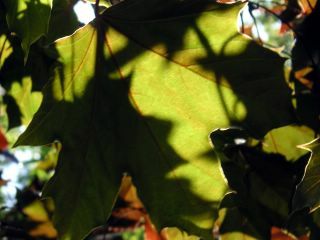 Here's what each leaf looked like but imagine the shadows constantly dancing. It was magical. Hubby and I were sitting in the shade of the maple tree next to the pond. Sunlight was shining through the leaves from the top with a dancing reflection from the pond underneath. It's hard to describe and I found it even harder to capture on film. Light and movement. Perhaps I should learn how to use the video capabilities of my new digital camera. Why? Because one son is so proud of his whiskers that he doesn't want to shave. He looked just like Shaggy...until yesterday. Shaving was a prerequisite for attendance at the Wizard's ballgame. While vacuuming the pool this afternoon, I discovered a surefire way to identify one insect. Just disturb its nest. The insect? Wasps. I have a sting on my face, my side and my back. Ouch! While weeding around my hostas yesterday, I discovered a surefire way to identify one plant. Just try to pull it. The plant? Stinging nettle. Here's a closer shot of the rose. 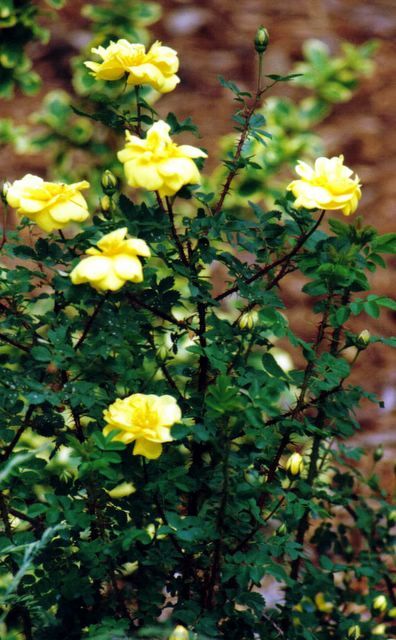 It is Harison's Yellow (with one r), also called the Pioneer Rose since it can be found along the trail all the way to Oregon. And the rest of the story? 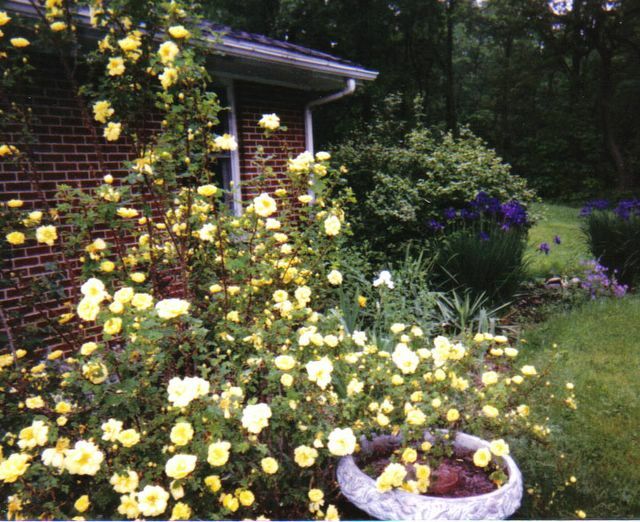 The year after we rescued the slip of rose from the grasses, the farmer cut down the tree, filled in the cistern and planted the knoll in soybeans. 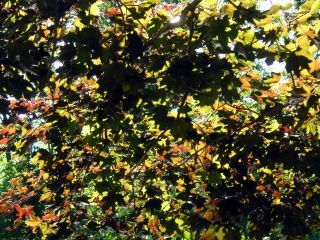 About ten years ago, Steve and I camped under a massive oak tree on a knoll in the middle of a cornfield behind a friend's farmhouse. We found a cistern and two yellow roses, all that remained of the original homestead. The current farmhouse was over 100 years old, so the roses were at least that old. The roses were a clear yellow with a wonderful scent, so I talked Steve into digging a start out of the waist high prairie grass. I planted that little slip in my garden, next to the front walk - my prized heirloom rose. It slept that first year and the next year it crept with a few blooms. The third year, it lept. As you can see, this rampant rose grew over the gutters of the house and made it practically impossible to get to the front door. I banished it to the Highlands (tree farm) when we remodeled and this spring I brought over several starts to plant along the fence in the wildflower meadow --far, far from the house. Here's one of two containers I designed for my talk last night at Lowes. It was given away as a door prize. I sure wish I could have brought it home. 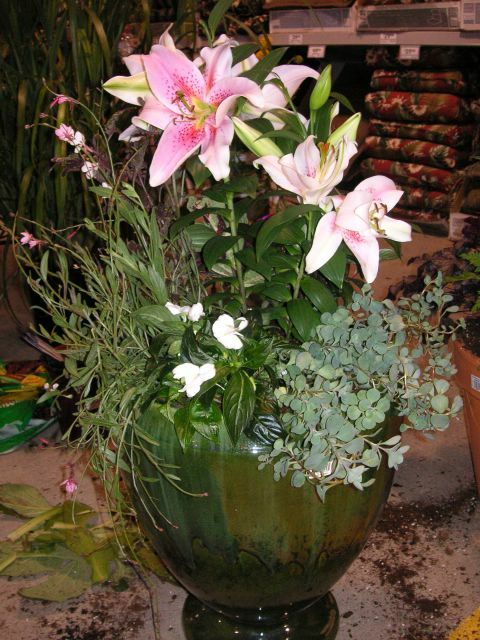 The focal point, of course, is the stargazer lily with its magnificent scent, but there is an attractive coleus behind it to take the star role once the lily passes its peak. Other plants (clockwise) are trailing gray-green sedum, white Catharanthus commonly called Vinca in the midwest, siskiyou pink, and then on the back is the coleus and bright pink "vinca" the color of the dots in the lily. 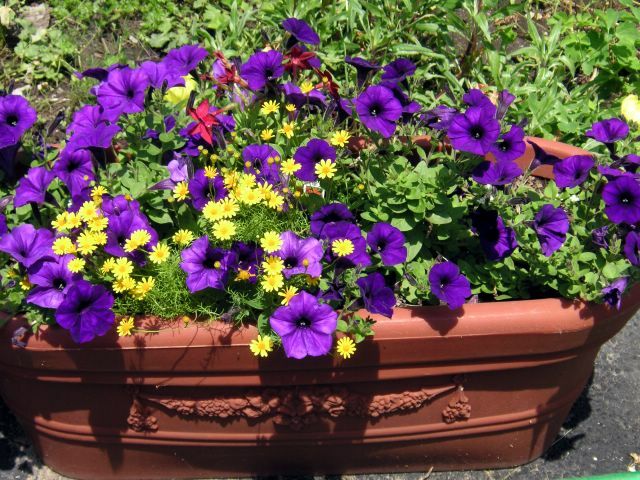 The container is a glazed ceramic jardiniere. Last Saturday we buried our parents' ashes in Leesburg Cemetery. We discovered that my grandfather bought 8 plots in 1932 and only four were used. We buried them together in beautiful walnut boxes which my husband made. The service was very touching as each family member shared a memory of Dad and of Mom and then sprinkled a shovel of dirt over the boxes. Aunt Katharine, my Dad's sister from Oregon, came for the service. At 86 years old, I was concerned that we would wear her out, but she is as spry, alert, inquisitive, and active as someone much younger. It was so hard to say good-bye, as I don't know when I will see her again. Before her visit, I went into a cleaning frenzy. It started with my new pantry which required cleaning and rearranging my kitchen cabinets. Then I did some painting and decided to take down every picture in the house and rearrange them. All the windows are sparkling, at least they were last week. I found room for about 100 books from my mother's estate by weeding out some books and removing non-book items from some shelves. And the list goes on. This week I've devoted my time to three volunteer projects that were on hold until after Aunt Katharine's visit: a newsletter for a nonviolence charity, a brochure for the church about small groups and an hour talk at a big box about container gardening as part of my Master Gardener hours. The talk is tomorrow and I'm still organizing it. I get to go through the garden center and select the containers, soil and plants to use for the demonstration. I'm a little nervous about it but it should be fun. The boys started drivers ed this week. The first two weeks are classroom and the third week is driving. Next week they get to start correspondence classes for high school credit. That foray into homeschooling should be interesting. And all the while my garden grows. The weeds are growing but I'm fighting that battle slowly. Hello, Mom? I'm just calling to chat. This is what I miss most now, just chatting about daily life, asking her questions, getting her opinion, learning what made her laugh recently, hearing about the editorial she cut out of the paper. Here's what I'd talk to Mom about today. What do you think of that color I painted my pantry and kitchen wall? What would you say the color is? Spice? Brick? She would nail it perfectly and perhaps talk about bold use of color. Consulting with Mom about feathering my nest has been a 30 year habit. She was always interested in what I was doing. Taste these new lemon cookies Ricky and I baked for his class project. Nice flavor but do you think there is too much shortening? How would you modify the recipe? Wouldn't it be good as a base for a fruit tart? Mom was a great cook - I know everyone says that about their Mom, but she really was. Some of the memories my childhood friends shared after her death involved her baking. She collected recipes and cookbooks and even in the 50s and 60s would serve us international food. The meals she served were thoughtful as to nutrition, presentation and taste. I just finished a very interesting book. Do you want to borrow it so we can discuss it? It's called Stones from the River by Ursula Hegi. Mom was one of the most intelligent people I've ever known and, on top of that, she was wise and wry. Over the years, we've shared books and shared ideas from books. Sure, there are others I can do this with, but they're not my mom. Mom, did you see the new pantry that Steve built for me? I created a roll-in space for my sweeper just like you had in Arkansas. She would have been pleased that I noticed and copied one of her creative ideas. She did things that I've not seen anywhere else, just because they made sense to her. In the two houses she built (1950s and 1980s), she held her own with the cabinetmakers and insisted on a baking counter that was lower than standard height to make it easier to knead bread, roll out pastry and mix dough. So what if it affected resale value and just wasn't done? This was her kitchen. Oh Mom, there are so many other things to talk about - our gardens, politics, the boys. No wonder our phone conversations rarely ended before an hour had passed. Ricky went to a swim party last night and Ron stayed home while Steve and I cooked dinner over a campfire at the River. Around 8:30, Steve called Ron. All was fine and as Steve was hanging up, he turned to me and said, "Well, no maudlin good-byes from that son." The phone immediately rang. It was Ron, who had heard Steve speak as he hung up and wondered if he missed anything. Steve looked at me with a glimmer in his eyes, "I just said that I love you." "Oh. Good-bye then," was Ron's unmaudlin response. Both boys have their driver's permits and they flashed them around at church to anyone who even might be remotely interested in this milestone. No one sees my drivers' license: the picture! the weight! the birthdate! Last weekend Steve gave each boy a short driving lesson, mostly on deserted country roads, although one boy had to pass an Amish buggy. The same boy had to drive about 300 yards on a state highway to turn into our river property. Someone was following him and it flustered him when he had to turn into the driveway. He took the turn too quickly and drove into the ditch. Steve was able to drive out of the ditch without a problem. The boy was astonished that Steve just chuckled and wasn't upset.